A few weeks ago, Eric and I took a trip down the Blue Ridge Parkway. We tried to time our trip to coincide with the rhododendron bloom in the North Carolina mountains, specifically at Craggy Gardens on the parkway just north of Asheville. While the native rhododendrons, Rhododendron catawbiense, were just beginning to show some color, the flame azaleas and mountain laurel were in full bloom. It was beautiful! 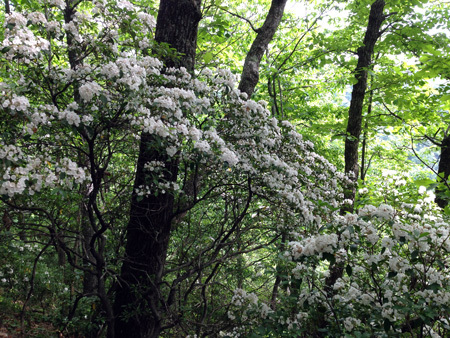 Mountain laurel in full bloom. When we stopped to take some pictures, we noticed that a few of the azaleas had some strange growths on them that looked like some type of gall. 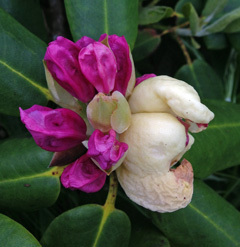 It turns out that this was the azalea gall which is quite common on both native and hybrid azaleas. Catawba rhododendron is also quite susceptible. 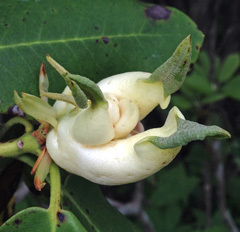 In fact, the majority of the rhododendrons growing on the rhododendron bald above the Craggy Gardens Visitor Center had at least a few of these unusual, fleshy galls. I’ve written about galls on plants before but most of those I have talked about were galls that developed in response to insect activity. 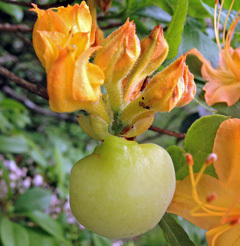 The azalea gall, Exobasidium vaccinii, is caused by a fungus which infects the leaves, flowers, and branch tips of azaleas, rhododendron, and certain species of Vaccinium like blueberries and cranberries. The fungus causes abnormal growth in the tissues that are infected. These swollen tissues form the gall and cause distortion of the leaves, stems, or flowers. Azalea galls can be light green, pinkish, or (as we most often observed) white. During the late spring and early summer, a white spore layer forms on the surface of the gall. This may be why all the ones we saw were white. These spores are dispersed by wind or rain to healthy leaves or flower buds on the same or different susceptible plants. The fungus remains dormant in these tissues until the following spring when new galls form soon after the plant begins to grow. Once the spores are released, the gall begins to turn brown and eventually dries up and falls to the ground. Cool, wet weather favors the dispersal of the fungal spores. 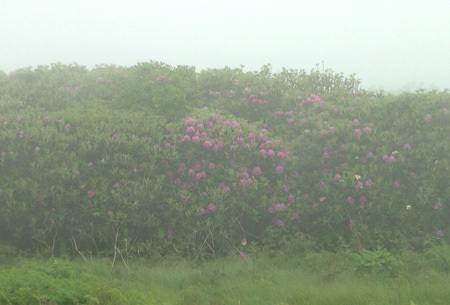 Up on the ridge tops of the Blue Ridge Mountains where native rhododendron and azalea are prevalent, fog and misty rains are common in the spring and summer. These conditions are perfect for the spread of this disease. 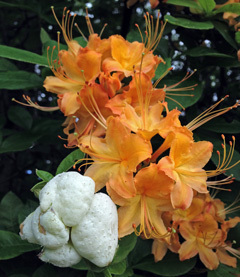 Though the azalea galls may look harmful, normally, they do not have an adverse effect on the plants. However, if cool, wet weather persists during the time of spore dispersal, the disease can spread more readily and result in the formation of many more galls the following spring. This can sometimes have a negative effect on the health and vigor of the plant. is affected by the gall. 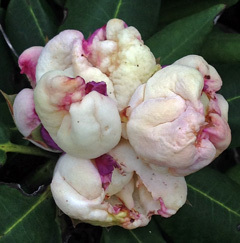 Azalea gall is a common problem in many hybrid azaleas. Physical removal of galls is the simplest control method. Galls should be pruned out with shears before the white spore layer forms. If galls are prevalent or conditions are favorable for the spread of the disease, fungicide applications may be warranted. Bonide Fung-onil or Bonide Mancozeb can be applied according to the label directions to control azalea leaf and flower gall. Begin applications just prior to bud break in the spring.